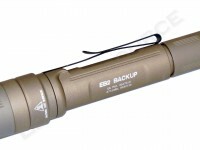 Is the SureFire EB2 Backup still a backup, or is it a primary light with a humble name? Derived from the compact single-cell EB1 Backup, the EB2 Backup is a two-cell version with increased performance and up to 500 lumens of output. The EB2 has more than two hours of tactical runtime, or 67 hours on the 5-lumen low mode, and is available in two colors – black or desert tan. Like the EB1, the EB2 has the same subdued styling and a choice of click-type or two-stage tactical tail switching. Weight with Batteries: 4.2 oz. 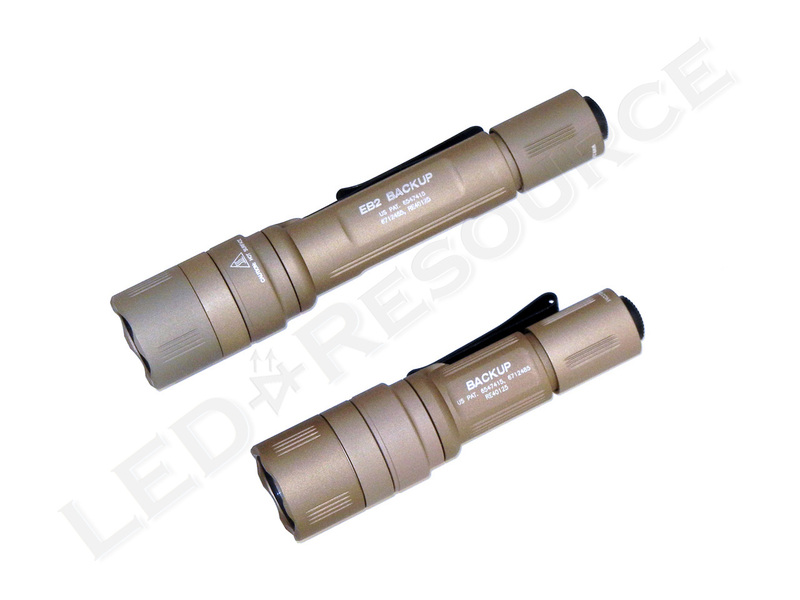 MSRP for the EB2 Backup is $235, and the light is available in two colors (black or tan) with two tailcap options (tactical and click-type). Black has a standard smooth finish, whereas the tan version has a slightly rough finish that is less slippery. 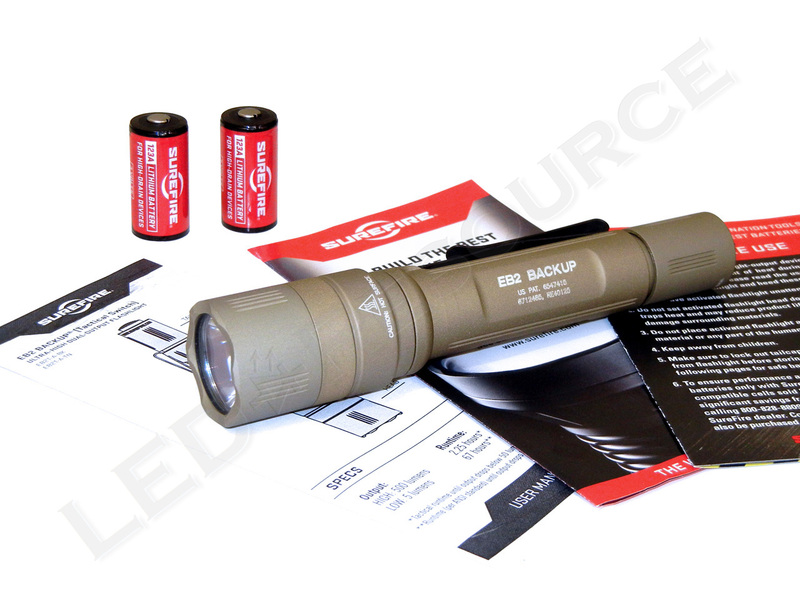 We received our EB2 in pre-production packaging, but production models will come in a cardboard box with similar contents including: SureFire EB2 Backup, 2 x SF123A lithium battery (installed), SureFire sticker, and user manual. 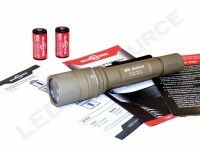 The EB2 is powered by two lithium 123A batteries and fully compatible with 3.2V rechargeable lithium-phosphate batteries, such as the K2 Energy LFP123A that SureFire offers as an alternative to expensive primary batteries. Lithium batteries have higher energy density than regular batteries, so low-quality or counterfeit batteries can be dangerous to use. 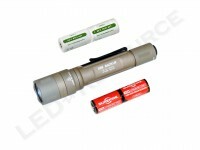 SureFire recommends using only quality lithium batteries from Duracell, Energizer, Panasonic, or SureFire. 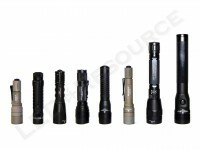 The EB2 has a length of 5.8”, which is slightly longer than the average tactical flashlight. 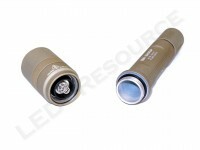 The aluminum body is type-III anodized for protection against scratches and corrosion. Behind the crenelated bezel is an anti-reflective coated glass window that protects the Total Internal Reflection (TIR) optic. The EB2 has the same dual-spring design as the EB1, which uses springs on both the head and tail contacts for increased reliability. The EB2 is a pocket-friendly light and lacks aggressive knurling. The two-way pocket clip, which also stops the light from rolling on a flat surface, allows bezel-up or bezel-down carry. Two switch options are offered, and the tactical model is shown below. Tail caps are not interchangeable, as the electronics in the tactical version are programmed differently. To activate the lockout tailcap feature, unscrew the tail cap until the light no longer turns on (about a quarter-turn). Two output levels can be activated using the tail switch. On the tactical model, reduced output mode is activated by a half-press for momentary, or a quarter-twist for constant-on. On the click-type model, two presses or clicks will activate low output. On the tactical model, maximum output is activated by a full-press for momentary, or almost a full-twist for constant-on. Momentary maximum output can always be activated by fully pressing the tailcap, even from constant-on low output. On the click-type model, a single press or click will activate maximum output. Using an Osram Oslon Square LED, the EB2 has a maximum output of 500 lumens and 16,000 candela. 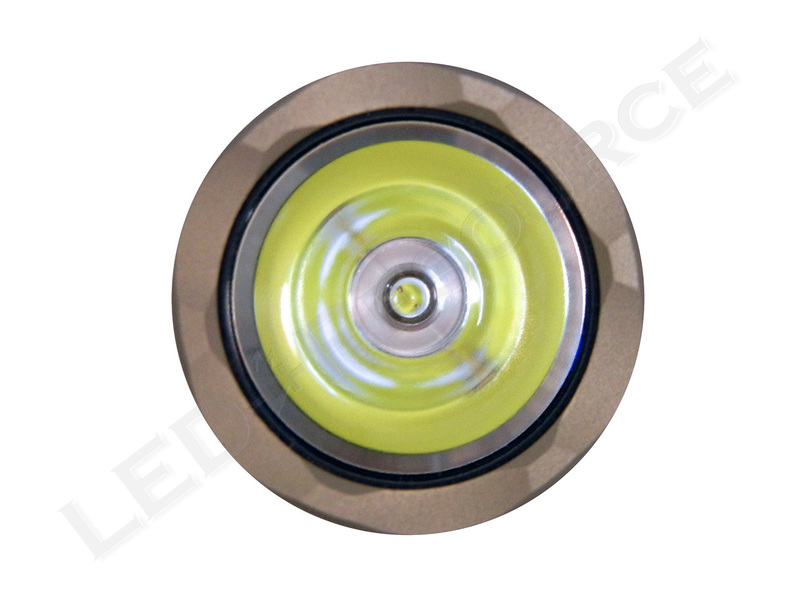 The EB2 (and E2DL Ultra) is among the first to use this LED in a flashlight, and the small surface area of the Oslon Square results in a tight beam pattern even with the same TIR optic as the EB1. Beam pattern is focused and clean, and the hotspot is slightly bigger than that of the EB1. 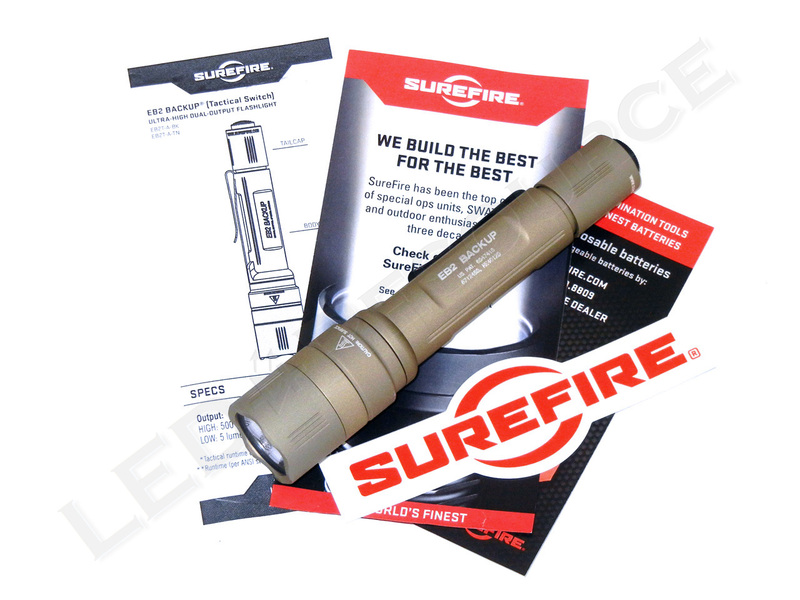 SureFire uses tactical and total runtime, which are not necessarily consistent with ANSI FL-1 Standard specifications. For the EB2, maximum output runtime is given as tactical runtime (measured until output drops below 50 lumens), and lower output runtimes are given as total runtime until battery exhaustion. During the first 15 minutes of operation, the EB2 uses step-down regulation to reduce output to 60% and have an extended runtime of 2h 15min. Compared to the P2X Fury, which is also 500 lumens but with a more gradual step-down, the EB2 has an extra hour of useful output at more than 250 lumens. 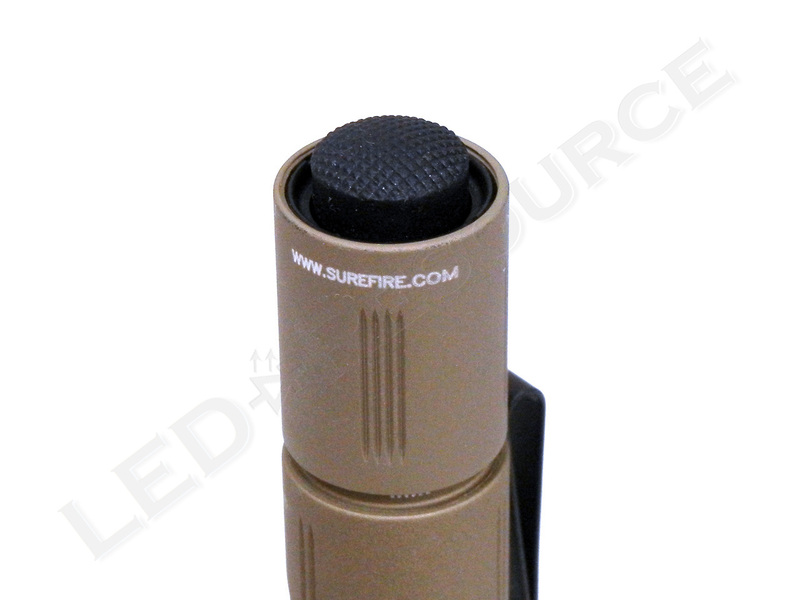 Even though it has Backup engraved on its side, the SureFire EB2 Backup is certainly a capable primary light. 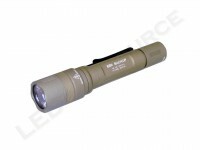 The EB2 uses a TIR optic to focus 500 lumens of output into a far-reaching beam, and optimized regulation balances output and runtime. As with the EB1 Backup, the EB2 is unobtrusive when carried in a pocket due to its slender and smooth styling, and includes a two-way pocket clip. The Backup series is notable for smooth styling that doesn’t get in the way of clothing, and aggressive designs aren’t always ideal for every user. 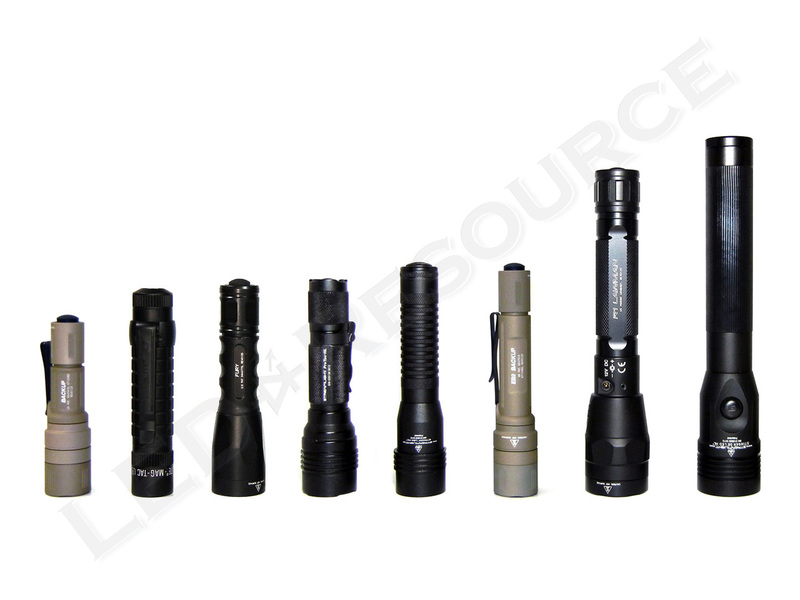 Among SureFire’s lineup of high-output lights, the EB2 sits above the entry-level P2X Fury (now a series that includes Defender and CombatLight models) and below the E2D LED Defender Ultra (not shown above). The EB2 has a smaller bezel than the P2X and lacks the crenellations and Strike Bezel of the E2DL Ultra, making it a simple, no-frills primary light. 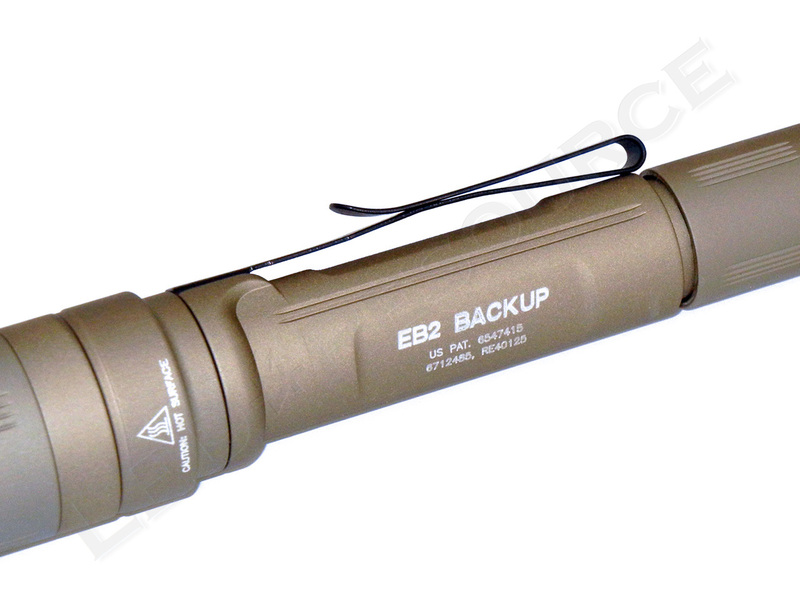 No matter how you look at it, the SureFire EB2 Backup is more than just a secondary light. You should list a CON as being 275 lumens of true output once the light enters regulation. This is what the light is operating at for most of the time. 500 lumens is just a flash in the pan. I refuse to even consider this light to be 500 lumens. Should be called a 275 lumen light since this is the bulk of the runtime. We do not judge lights by step-down behavior because there are significant benefits and drawbacks either way. For most users, what’s important is the initial 5-10 minutes. 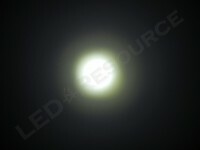 If you are using a light for more than an hour, output is probably not the driving factor. When a light of this size maintains regulation above 400 lumens, it will be too hot to comfortably hold, as was the case during our P2X Fury runtime test. 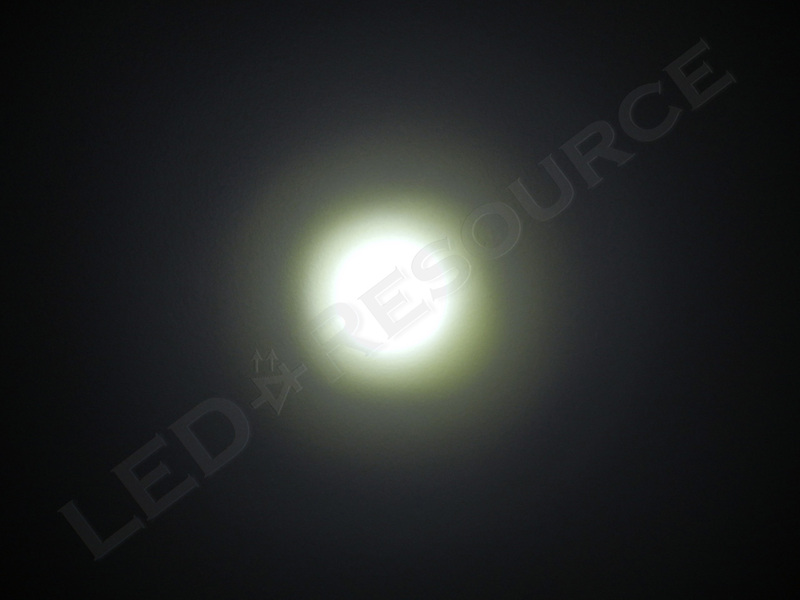 At high temperatures, system efficiency and LED life decrease dramatically. I respectfully disagree with you, that for most users just the initial 5 to 10 min of output is important. 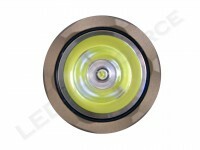 With this light you are really getting 275 lumens not 500. Since it runs at 500 lumens for such a short time, I feel it is dishonest to even call this light 500 lumens. If I buy a 500 lumen light I expect it to be as such for the bulk of the runtime. 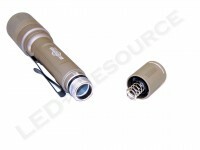 If above 400 lumens creates too much heat, then a light of this size needs a more efficient emitter and better heat sinking. The short time this light does run at 500 lumens must really drain the battery. I am very disappointed Surefire calls this a 500 lumen light. It would be more accurate to say that initial output with extended runtime is preferred by the target market, as indicated by a manufacturer study of law enforcement professionals. There are very few usage situations that would deprioritize runtime in favor of output (except for area or fixed lighting), and tradeoffs is a key concept in engineering to understand. Simply put, current battery and emitter technology does not allow a 2 x 123A light to run at 500 lumens for two hours, but the EB2 achieves a decent balance of both while still having higher output than previous generation 200-lumen lights. Thank you for the reviews you provide. 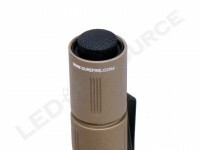 The quality is excellent, and I appreciate knowing exactly how a light will perform before I purchase it. Saves me time and money. Glad I can provide the information that you are looking for. Many features are subject to opinion, so I try to provide as much detail as possible. You both got very different results. We’ve been working with Jim to investigate the discrepancy, but our test results are consistent with manufacturer specifications. 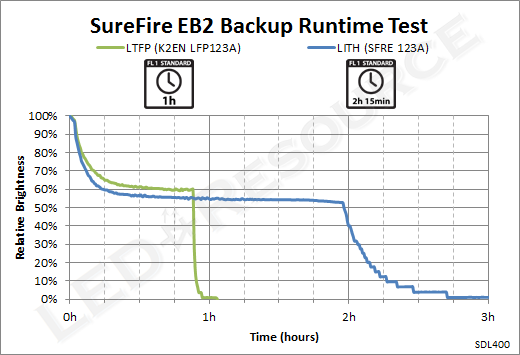 LED-Resource conducts runtime testing in a controlled environment, so I suspect that test conditions and temperature fluctuations may have caused Jim’s E2DLU and EB2 to have a reduced step-down and shorter runtime. Great test. I think Scott is not considering that the step down occurs if the light is left on for a long period over 5 minutes. 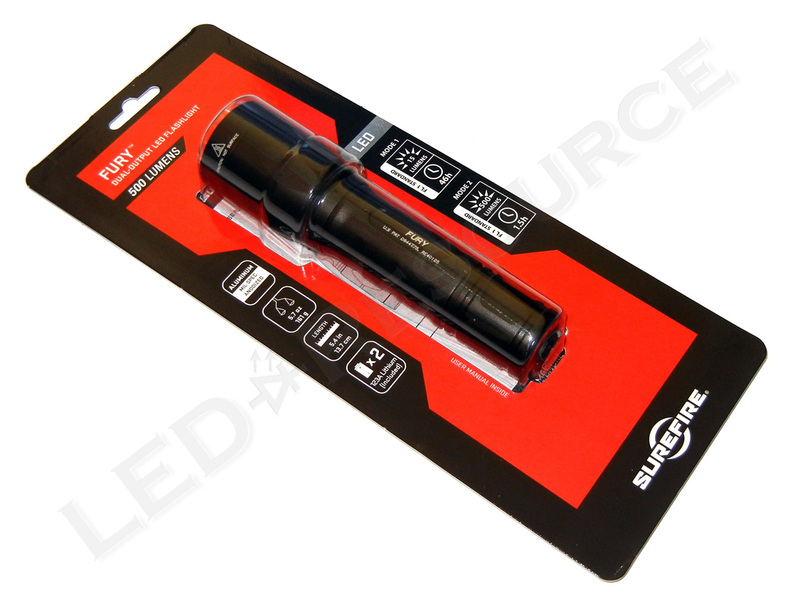 If used for 2-3 constant minutes here and there, it will come on at near 500 lumens every time you turn it on for a good percentage of the battery life. Towards the end of the 123’s capacity, churning out 500 then won’t happen. If the light is used in short bursts of 1 minute increments, then is it safe to assume that the battery life is probably in total around 1 hour? Are these realistic assumptions regarding this light? Indeed, besides in a runtime test, there is no reason for step-down to be noticed during normal use. 45 minutes to 1 hour of output bursts seems reasonable to me. Robin, can you identify what kind emitter does EB2 is use? is it XPG or XML or something else? Please see the Performance section. It uses an OSRAM Oslon Square LED. I was looking at whole article but I was not realize it was there, thanks for your answer. 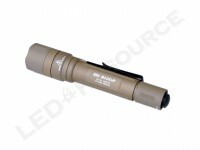 I couldn’t find any way to contact you so I have to do it through the comment section Can you please test the Elzetta Bravo 650 lumen AVS model? 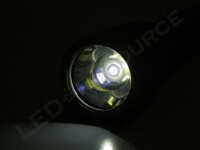 Flashlightguide.com reviewed this light. I trust you a lot more!!! They claimed 95% regulation run time for this light. The Elzetta Bravo quality is as good or better then Surefire and is definitely worthy of your time.